//out-file,o - means that option name is "--out-file"
//and its short alias is "-o"
I will not describe the piece of code in detail, just say that we here process our packer command line easily and conveniently using boost::program_options library. I put all options available via command line (bool force_mode, bool repack_resources, bool rebuild_load_config, bool strip_dos_headers, unsigned long file_alignment, std::string input_file_name, std::string output_file_name) to the packer source code, and I will not explain what exactly has changed, because many parts of the code were slightly modified. Besides that, at the end of the source code I made output of the elapsed packing time, which was counted with boost::timer library. 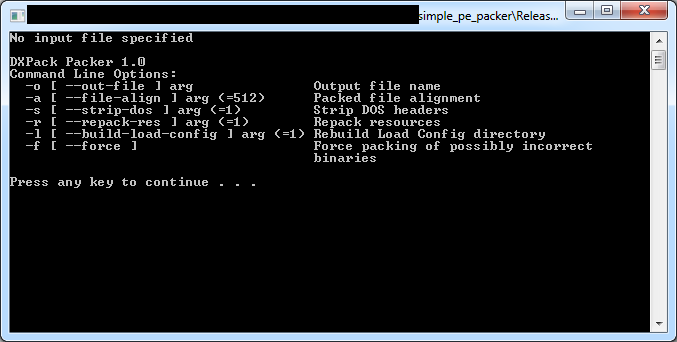 You can view all changes as always by downloading the full packer solution. This version of the packer could be perhaps considered completed. Yes, it creates suspicious imports and probably has other issues, but it is fully operable, it supports things that other packers can't do (for example, TLS with callbacks or loading configuration repacking) and it has command line interface. So, besides the source code I will share the packer EXE file, in case it will be useful for someone. UPD: New version with fixed bugs is here.